Lousios Gorge is a deep canyon in central Peloponnese situated in an impressive mountain area, with small picturesque villages and ‘cliff-hanging’ monasteries. This is a bit off the beaten track. For those that like to go hiking this is a great area to visit. A five (5) kilometer gorge with several hiking trails, and a very good bridge crossing Lousios river. You can walk from one village to another following a dirt road through the mountains in beautiful scenery that even has some small waterfalls. The Lousios river is where Zeus used to bath himself, In the spectacular densely vegetated gorge and in the river’s crystal clear waters. The Lousios (Greek: Λούσιος) is a river and a gorge in western Arcadia that stretches from Karytaina north to Dimitsana in Greece. The river begins near Lykochori and flows through the Lousios Gorge. The river is treacherous and flows rapidly. It empties into the Alfeios 2.5 km northwest of Karytaina and south of Atsicholos. The river forms a deep, narrow gorge. Its length is approximately 15 km from north to south and its width is approximately 2 km wide. The gorge is very popular amongst hikers. At the northern end of the gorge lies the town of Dimitsana. At the southern end of the gorge is the ancient city of Gortys with the temple of Asclepius. Much of the gorge is heavily forested, and there are steep cliffs. Definitely, a journey to Arcadia will give you unforgettable memories! TOUR IN DELPHI: A DAY TO THE NAVEL OF THE EARTH. An Unesco protected heritage located only two hours and a half away from Athens offers a view into the myths of the country. 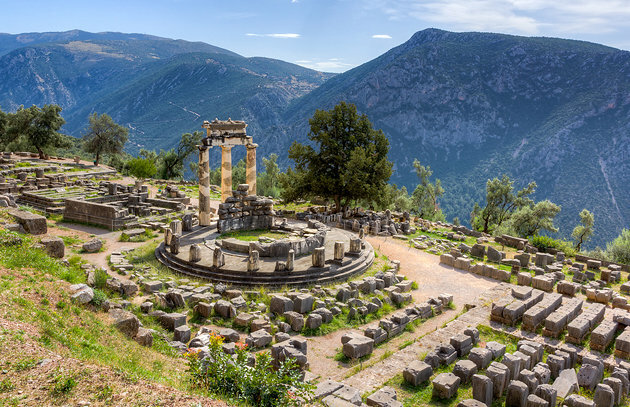 The tour in Delphi will provide you with a full experience of what was the oracle of Delphi and the Pythia. We will learn about ancient Greek myths, like Apollo’s killing of the serpent Python and subsequent exile. The visitors will have the chance to visit the temple of Apollo, the treasury of the Siphnians and the Athenians, the theater and the stadium where the Pythian games were held. Subsequently, we will visit the museum where we will admire some of the most remarkable artifacts that were discovered in the area like the famous charioteer and the statue of Antinoos and will discuss in depth about the role of the sanctuary. Finally, we will visit Itea to enjoy the ancient port of Delphi , the ancient Kirra and to discover the magic landscape of the plain of Krissa. After meeting your tour leader, you will begin your tour in Delphi. Along the way, you will see the plain of Beotia, an agricultural center surrounded by cotton plantations and you will also pass through the city of Theva, the birthplace of King Oedipus. You will continue towards Mt. Parnassos, making a brief rest stop outside the town of Livadia. You will then drive on to Delphi, which dates to the ninth century B.C. and whose allure includes an amazing hillside setting and ruins that will intrigue even the most skeptical among you. Delphi was the site of the Delphic oracle, the Greek world’s most important oracle. The area was also a major site for the worship of the god Apollo after he slew the Python, a deity who protected the navel of the Earth (center of the world) in this location. You will see the Roman Agora, walk along the Sacred Way, and view the monument of the Argive Kings. the treasury of the Athenians, the Athenian Stoa, the Polygonal Wall, the monument of Platea and the Temple of Apollo where the oracle resided. Above the Temple, you can visit the well preserved 3rd-century Theater. 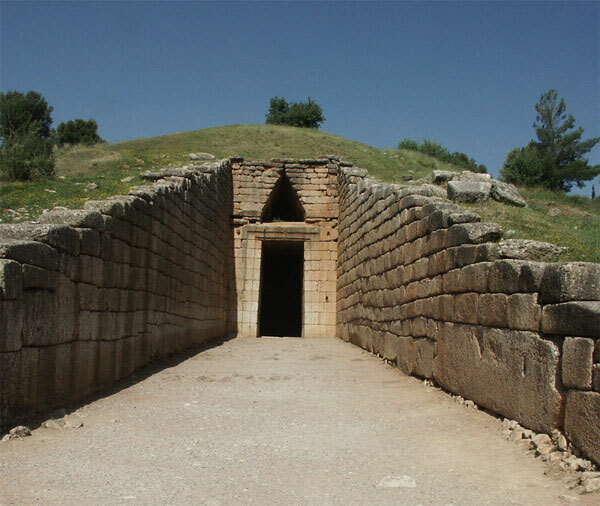 On the lower slope of the mountain is the Tholos, a building whose exact purpose is unknown but architecturally speaking is considered one of the masterpieces of the ancient world. You will also see the Palestra where the athletes trained in preparation for the Pythian Games. After your visit to the archeological site, you will visit the adjacent Delphi Archaeological museum which houses the ancient artifacts that were found at the site. As its centerpiece, are the antiquities found in the complex of Oracle which dates from the 18th century B.C. when the oracle was founded to its decline around 300 A.D. Exhibits include the frieze of the Treasury of the Sifnians, the Naxian Sphinx, the metopes of the Athenian treasury, the famous Charioteer, originally created to commemorate a victory during the 476 B.C. Pythian Games, and many other artifacts. After your visit to the museum, rejoin your transportation and begin the drive back to Athens. Along the way, a stop will be made for a traditional Greek lunch. After lunch, you will start your drive back to Athens. *Note: The itinerary may vary according to local conditions. **Special Notes: All rates stated are in Euro funds. Our quotes include all taxes, vehicle and English speaking driver, highway tolls, car fuel, and parking and exclude lunch, entrance tickets and guides in sites unless stated otherwise on this page. Payments are to be made in cash (Dollars or Euros) at the end of the services or prepayment by PayPal (4% extra) and credit card (3% extra). ***Important Note: The driver will wait maximum 30 minutes after the indicated pick up time for your group, please be on time otherwise you will be charged for «Non-Show» fee and miss the tour. Extended Delphi tours: There are so many things to do in the surrounding area: there is the Monastery of Osios Loukas, famous for its mosaics; the charming village of Arachova; and the imposing mountain of Parnassus. Your driver will learn your interests when he meets you, and tailor the experience based on what he believes you would like best. Please note that on this tour, your driver is not licensed to accompany you inside the sites. If you want a licensed guide to tour the sites with you, you can hire one at extra cost. The hillside site of Delphi requires almost continuous uphill walking over dirt and some paved surfaces to visit. Guests must be in good health and sensible walking shoes are a must. At the museum, there are steps to enter the building. Dress: Comfortable clothing and sensible, flat-soled walking shoes are recommended. Sunglasses and sunscreen are suggested. Our tour will start with a visit to the famous sanctuary of Demeter and Persephone of these two major goddesses of agriculture. The myth describes that Persephone one day went to collect flowers and the earth suddenly opened and Hades the god of the underworld abducted her. Dimitra her mother totally heartbroken wandered around endlessly arriving at Eleusi where she sat at a stone, on the so-called mourning rock (agelastos petra). Feeling betrayed by the Gods when she discovered that it was Hades that had taken her daughter she abstained from her agricultural duties and the earth seized to be fertile and famine spread around the world. Finally Persephone was released with the intervention of Zeus and Dimitra allowed the earth, the flowers and the plants to bloom again. Visiting the land of Eleusi we will have the chance to follow the steps of the myth of the Hades and the Persephone. We will see the ritual chamber where the Mysteries of Eleusi were held, the cave of Hades that was the gate to the Underworld and we will visit the archaeological museum . The site of Eleusi is a really magnificent and enigmatic place and creates an interesting contrast with the industrial port that lies just in front of the museum. The second stop of our tour will be the city of Corinth. Corinth was one of the most important cities in antiquity especially from the 7th century onwards and throughout the roman times. A really remarkable city located between two harbors and under the shadow of the imposing fortress of Akrokorinthos. A marvelous city full of secrets where one can admire the most ancient temple of Apollo , the Fountain of Kastalia and a typical roman city with beautiful streets, baths and public buildings. Finally in Corinth the visitors can take a dive into the first Christian years by visiting the Vema of St Paul from where he preached for the first time the arrival of Christianity to the World. The visit will end with a glimpse into the Archaeological museum recently refurbished where the visitor can admire artifacts from the 1O th c. bc, and most important two newly exhibited statues, the two Kouroi from the area Klenia that were victims of antiquity smugglers but were found and were confiscated in 2010 and only recently restored and exhibited in the museum in a sumptuous space. Part of the remarkable poem of Pindar written for Kalipateira, the mother of many champions, winners of the Olympic games , Games that were held in Olympia in the sanctuary of Ancient Elis in the northwestern part of the Peloponese. The trip to Olympia is ad hoc an unforgettable experience. On the feet of the mountain Kronios, just in the middle of olive trees and Judas trees lies the sanctuary of Altis , the most popular sanctuary dedicated to Zeus , where the Olympic games were born in the 8th century BC: a location of major attraction in antiquity that continues to attire thousands of travellers because of its unprecedented beauty and its historical importance. Going back to the time and making a mental jump to antiquity we will enliven all the important buildings of the site, the magnificent temple of the Zeus with the colossal statue of Fidias, the most ancient temple of Hera, the Filipeion, the different athletic premises,like the palestra ,the gymnasium and the stadium and we will have the chance to talk in depth for the institution of the Olympic games from the antiquity to our age. The experience will be completed with a visit to the archaeological museum where the visitors will study the findings of the excavations in the territory and to contemplate on the highlights: the sculptural decoration of the temple of Zeus, the Nike of Paioniou and the Hermes of Praxiteles. 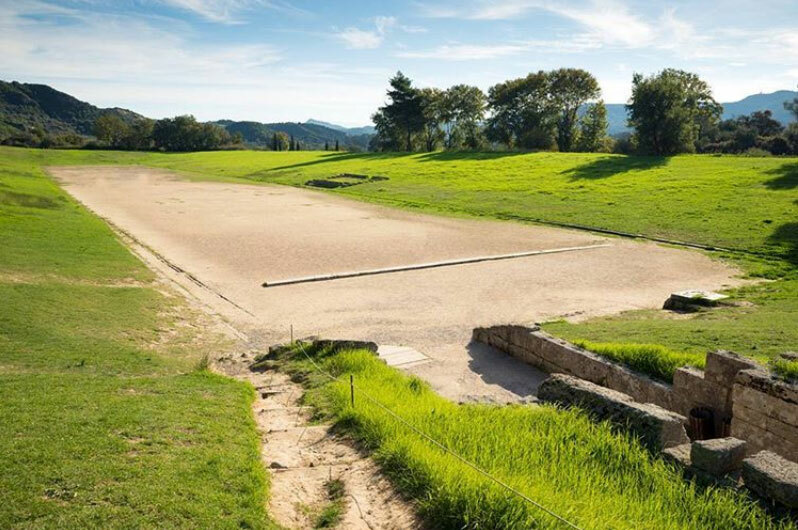 The day trip in Olympia will be completed with a quick visit to the museum of the Olympic Games where the visitor will complete his knowledge on the various sports and athletic contests and on the procedures that the ancients were following during the Olympic games. Late afternoon return to Athens via the majestic mountains of Arcadia, the paradisiac residence of the Pan and the nymphs. A medieval stronghold with a holiday air,Nafplion is really two places in one-a modern seaside resort.and the old town which once served as aFrankish-Venetianbulwark with its fortress dominating the area from the summit of palamidi.Bourdzi,the venetian castle,is on a smaller islet,in the middle of the Bay. Regarded as one of the most romantic cities all overGreece, Nafplion was the first capital of the newly born Greek state between 1823 and 1834. After meeting your driver you will depart Athens and drive along the coast. You will access the peninsula by crossing the awe-inspiring Corinth Canal. You will realize the enormity of the achievement as you will have the opportunity to photograph it en route. After the Corinth Canal,you will continue on to Nafplion. Named after the mythical Nafplios, son of Poseidon, Nafplio first started to develop in the 7th century BC and since then it has known prosperity and progress but also invasions and occupation by many foreign conquerors. Nafplion today is a charming town, built by the seaside on the feet of two fortresses, Palamidi and Akronafplia and is full of neoclassical buildings, paved squares, and picturesque alleys. Your first visit of today is the Palamidi Fortress.Nestled on the crest of a 216-metre high hill, the fortress was built by the Venetians during their second occupation of the area (1686–1715).The bastions of the fortress were originally named after the Venetian provveditori. However, when it fell to the Ottoman Empire, the bastions were given Turkish names. Lastly, when the Greeks overthrew the Turks the bastions were renamed after Greek saints. One of the bastions, called the «Miltiades» ,was used as the prison cell of Theodoros Kolokotronis, a hero of the Greek Revolution.The fortress commands an impressive view over the Argolic Gulf, the city of Náfplio and the surrounding country. After this visit, you meet your driver again to drive you back to Nafplion port where you will enjoy a 5min boat ride to the castle of Bourtzi located in the middle of the harbour of Nafplio. The Venetians completed its fortification in 1473 to protect the city from pirates and invaders from the sea. The Greeks regained it from the Turks on June 18, 1822, from where they assisted in the siege of Nafplio. Until 1865 it served as a fortress. It was then transformed into residence of the executioners of convicts from the castle of Palamidi. From 1930 to 1970, it served as a hotel. Now,you will be free to explore on your own this beautiful town, explore its alleys, sit by the waterfront at one of the many ouzeris overlooking the small island of Bourtzi and taste the traditional mezedes of sea food and not only, taste the best Gelato in Greece. *Students of non European Union countries holders of an international student card are entitled to 50% discount on the entrance fee. Young people up the age of 18 are entitled to free admission. European Union students are entitled to free entrance while European Union senior citizens over 65 have 50% discount on entry to all Greek museums and archaeological sites. Corinth (/ˈkɔrɪnθ/; Greek: Κόρινθος Kórinthos), was a city-state (polis) on the Isthmus of Corinth, the narrow stretch of land that joins the Peloponnesus to the mainland of Greece, roughly halfway between Athens and Sparta. The modern town of Corinth is located approximately 5 kilometres (3.1 mi) northeast of the ancient ruins. Since 1896, systematic archaeological investigations of the Corinth Excavations by the American School of Classical Studies at Athens have revealed large parts of the ancient city, and recent excavations conducted by the Greek Ministry of Culture have brought important new facets of antiquity to light. For Christians, Corinth is known from the two books First Corinthians and Second Corinthians in the New Testament. The 2nd book of Pausanias’ Description of Greece is devoted to Corinth. Ancient Corinth was one of the largest and most important cities of Greece, with a population of 90,000 in 400 BC. After the Romans built a new city in its place and made it the provincial capital of Greece in 44 BC, the city’s population was between 50,000 to 700,000 according to different sources. The settlement dating to 5000 B.C that was discovered in the Korakos region is testament to Korinthos’ habitation since the Neolithic Age. In antiquity Korinthos was one of the largest and most important cities in Greece. It played a significant part during the Peloponnesian War and after 200 B.C it became the capital of the Achaean Confederation. Under Julius Caesar it was elevated to the capital of the Achaia province. During the middle Ages it was associated with its impressive fortifications at Akrokorinthos (Acrocorinth). A powerful earthquake destroyed the city in 1858, which was rebuilt with good earthquake resistant specifications on a good town plan, 9 km to the north of the ancient city. The charming town of Palaia Korinthos is situated on the site of Ancient Korinthos. Korinthos is 84 km to the west of Athens. – The seaside zone, especially around the El. Venizelos square with the impressive statue of Pegasus and the small port of Floisvos with the marina. Close by, you will find Kalamia, an extensive and established pebble strewn beach, with many coffee shops and taverns all along it. – The pedestrian walkway on Pilarinos Zografos Street is a much frequented meeting place for the residents with stores, coffee shops and bars. – The central Perivolakia square – park with the coffee shops and restaurants is the ideal location for stopping and resting. Across the road (on Ethnikis Antistasis Street) is the city’s impressive Court House, while the statue of Archbishop Damascenus (1890-1949) stands at the small square precisely in front of the Courts. – The Apostolos Pavlos (Apostle Paul) metropolitan church, on the street of the same name, which was built after the 1928 earthquakes. The “Apostle to the Nations” lived and taught here for a short period and is the city’s patron saint. – The Historic-Folklore Museum (close to the El. Venizelos square), with exhibits of 3,500 18th and 19th century costumes from all over Greece. – The Ecclesiastical Museum was established in 1973 and contains significant ecclesiastical exhibits (manuscripts, high priest vestments, portable icons, gospels, photographs etc). – The Municipal lending Library (84 Pilarinos Street), with notable collections and the Municipal Art Gallery (4 Kolokotroni Street). – Acrocorinth (the residence of the Sun God! ), 3.5 km south of ancient Korinthos, at the peak of a 575 m high hill, has always been the fortified acropolis of Korinthos. It is the oldest, largest and most impressive castle in the Peloponnese, whose walls were built during the middle Ages. It is worth seeing the ruins at the temple of Aphrodite, and the relics of the Christian Churches and the Turkish buildings, on the peak of the hill. In addition to its archaeological significance, Acrocorinth is a rich botanical garden with numerous indigenous Greek wild flowers and belongs to the “Natura 2000” European Union habitat network. On the opposite hill (Penteskoufi) there is a smaller medieval castle (13th century), which is however difficult to access. – The Corinthian Canal: the idea for the canal, which connects the Saronic to the Corinthian gulf, was conceived by Periander (6th century B.C. ); however, the canal was finally opened after Greece’s independence, during the period 1882-1893. It has a length of 6,346 metres, a width of 24.6 metres at sea level and a depth of 8 metres. – Possidonia (on the western side of the canal, close to the Corinthian gulf), where you can see the Ancient Passage Way (Diolkos). It is a paved road that was constructed due to the need for rapid passage by ships from the Saronic to the Corinthian gulf and vice versa. It was constructed in the early 6th century B.C. and is associated with Periander’s tyranny in Korinthos. Its western edge was reconstructed in the early 4th century B.C. It was used to transport small (especially military) vessels. This use has been attested by sources down to the 9th century A.D.
– Lechaio is a beautiful seaside town, 8 km to the west of Korinthos. The region was developed in the 6th century B.C, since Lechaio – together with Keghrees – were the city’s two ports. The ruins of the ancient port have survived to the present day. Excavations have uncovered the ruins of a palaeo-Christian basilica, to the west of the ancient port, which was constructed in the 5th century A.D in honour of the martyr Leonidis and the seven Virgins who martyred during the Decian persecution in 251 A.D. The church of Agios Gerasimos is also situated at Lechaio where Gerasimos Notaras was a hermit. There is a fertile valley in the wider region, where fruit and grape vines are cultivated. Argolis is a peninsula in the Peloponnese where myth, legend and ancient historic sites weave a bewitching tapestry and claim to receive over 3000 hours of sunshine per year. Meet kings and heroes from Homer’s epics, the Iliad and the Odyssey: Agamemnon, Menelaus and others. After meeting your driver you will depart Athens and drive along the coast. 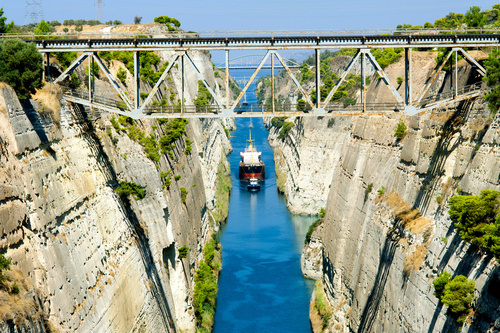 You will access the peninsula by crossing the awe-inspiring Corinth Canal. You will realize the enormity of the achievement as you will have the opportunity to photograph it en route. After the Corinth Canal,you will continue to Ancient Corinth. Ancient Corinth lies at the foot of the Acrocorinth citadel and dates back to 5000 B.C. Owing to its strategic geographical position, Corinth was a strong trading link between the East and West. Excavations at Ancient Corinth have revealed ample remains of the Classical Greek period and also that of the Romans. Visit the Temple of Apollo (dating back to the 6th century B.C. ), the fountain of Pinene, the market place, theater and Odeon, and several Roman buildings. A museum on the site is also of immense interest. Now you are on to Mycenae (a UNESCO World Heritage site),the fortified royal residence of King Agamemnon, leader of the Trojian War. The mighty citadel is surrounded by huge Cyclopean walls. Entrance to its Acropolis is through the famous Lions Gate, which symbolize the power of the kings of Mycenae, «a city rich in gold» according to Homer. Beyond the Lions Gate is the stairway leading to the Palace complex, the grave circle with six royal tombs, the courtier’s houses, sanctuaries, and other important buildings. Outside the walls are the beehive tombs, the largest of which is the so-called «Treasury of Athens,» ruins of private houses and a grave circle with 14 royal tombs and 12 tombs of private citizens. After lunch ,your next (short) stop is Nafplion, the first capital of Greece after the 1821 Greek revolution. 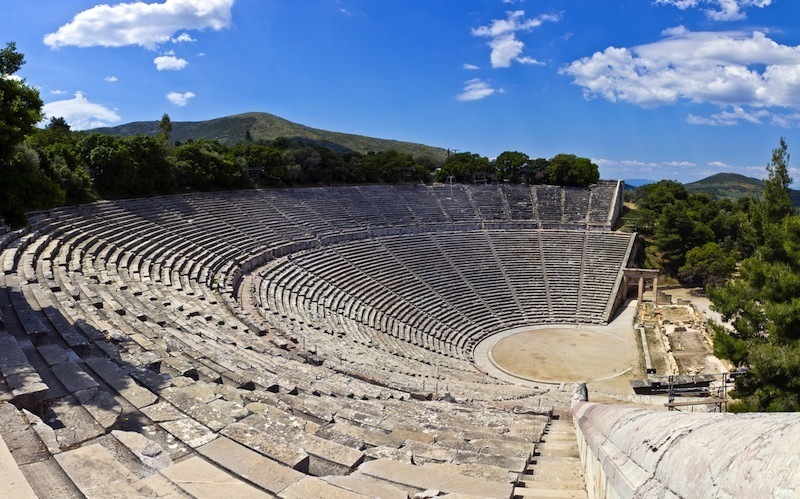 Afterwards, you will continue on to the UNESCO World Heritage site of Epidaurus. In antiquity, Epidaurus was the center of the Greek medical world and birthplace of Asklepios, patron god of medicine. Psychotherapy, hydrotherapy and brain surgery were some of the treatments performed here. You will see the principal monuments, particularly the temple of Asklepios, the Tholos and the 4th century theater which is considered one of the purest masterpieces of Greek architecture. Its acoustics are still almost perfect today. After your visit, you will begin your drive back to Athens. ***Important Note: The driver will wait maximum 30 minutes after the indicated pick up time for your group, please be on time otherwise you will be charged for «Non Show» fee and miss the tour. Restrictions: Please note that on this tour, your driver is not licensed to accompany you inside any site or museum.If you want a licensed guide to tour the sites with you, you can hire one at extra cost. Tips: Suggested starting time for this tour between 7:30am-8:30am. Starting from you and from your special interests in art history, archaeology, social history ,politics, cuisine we can prioritise your interests and create a tailor made walk for you based on what you want to know and learn about the city of Athens. Greece is one of the most important wine producers and although, in the modern world, Greek wine didn’t receive sufficient promotion and publicity, we know that in Ancient Greece and in Byzantium, wine was one of the most important commodities together with olive oil. Therefore In this tour we will try to narrate the history of Wine from the ancient to the modern times. In the first part of the tour we will discuss about the origin of wine, about the myths of Dionysus and about the birth of the theatre as it is inextricably connected with the cult of Dionysos. We will expand our discussion visiting areas of Athens where we can find items and objects connected with the everyday life of the Athenians and in particularly with the wine. Finally in the last part of the tour we will do a stroll in the wine bars of Athens and we will have the chance to taste some of the most characteristic and noble varieties of the Greek production and to learn to distinguish the special traits and aromas of the mosxofilero, the assyrtiko, the agiorgitiko, the xynomayro. In the capital of Greece Fun is spelt with a capital F. You want bars and clubs that will be open till the morning even during working week nights? You want to have dinner even after midnight? You want to dance all night to the rhythm of both local and international music? You want to spend the night outdoors with your (potential) lover, maybe by a worldwide famous monument, as the cold never lasts long? You want to attend remarkable classical or modern music concerts in winter or summer venues? You want to watch well-known international shows visiting the city? You want to watch any international film on its original version at any theatre? Well, all those are just a few of your choices while having the thrilling experience of discovering Athens by Night. Gazi It is THE hotspot of Athens and not unjustly so: “meze” tavernas (=restaurants where you can dine on middle dishes instead of individual main ones) restaurants of international cuisine, delicious “souvlaki” restaurants, pop, (hard) rock, mainstream, swing and retro, gay and lesbian bars and clubs, galleries, fringe theatres – you name it! And all that just a stone’s throw from the city center and accessible by the metro (“Kerameikos” station). Thissio Thissio is popular with Greeks and tourists alike who want to have a coffee or a drink marvelling at the Acropolis which catches their eye and dominates the scenery. It is undoubtedly the favourite walk trail of the Athenians. Plaka Right at the foot of the Acropolis hill, it is the traditional part of the city where time seems to have stopped at the 19th century. Folk music and dancing in Greek restaurants as well as tavernas and cozy cafes are the best choice here. Monastiraki and Psirri Right next to Thissio and still at the foot of the Acropolis, this wide area recalls the Orient: low buildings, narrow cobbled streets, a flea market, almost no access to the cars. Alternative bars and stylish restaurants lie side by side with old-fashioned cafes, Greek tavernas and shops of all kinds. Live Greek music in Greek restaurants is a possibility too. Kolonaki In the night, spirits are high also in the business area of the downtown where the famous boutiques keep the branches. Trendy bars and gourmet restaurants for all tastes see the Athenians return to the area where they work but this time to dance the night away.The area is brimful of art galleries too. Exarhia The rock side of the city. Here students, youngsters, alternative people share their views having a drink or a dinner in rather inexpensive restaurants and bars. Syntagma. In the area around Syntagma, as well as the streets that lead to Monastiraki you’ll find innumerable new hangouts that complete Athens’ nightlife: Romvis, Kolokotroni, Thiseos and many more cobbled narrow roads gather crowds that let themselves to the music’s rhythms and hip cocktails. Karytsi and Agia Eirini squares are considered highlight areas by the Athenians. Karytsi Square Mousouri Theatre and a couple of traditional cafes once stood alone here. Suddenly everything changed! 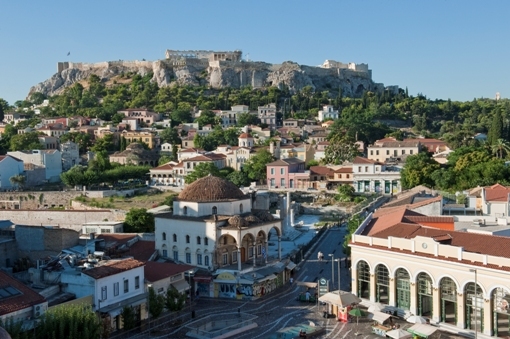 Athenians started discovering every corner of their city. The quiet and picturesque square, with the church of St. George dominating in the center, quickly became a favourite hangout in Athens: all day long cafes, bars that will satisfy all music preferences packed with people, night or day, coming off work, or just wandering around after shopping. There is a place that will do for you, either you want to dance to loud music all night long or have a quite talk with a friend. Agia Eirini Square Agia Eirini Square is the king of Athens nightlife, situated at the corner of Aiolou and Karagiorgi Servias, next to Kolokotroni street, near Plaka and Monastiraki. Tables and chairs of the various cafes and bars are constantly cluttered with people chatting away while enjoying the imposing neoclassical buildings amongst the narrow streets and the church of Agia Eirini. Where new meets old this is an atmosphere you shouldn’t miss! Here you’ll discover the most hip bars of the area, inspired cocktails and drinks, and as rumours have it the best souvlaki in town. Enjoy the magic!